Animefringe: Features: Kia Asamiya - The Veil of Secrecy is Lifted! Kia Asamiya - The Veil of Secrecy is Lifted! What's the story with Batman: Child of Dreams? Did DC come to you or vice versa? Kia Asamiya: I pleaded with DC for two years. When they were bought out by Time Warner, I tried again, and eventually I got through. Then, when I talked to the editors at DC, they said they would have said yes right away! Why did you combine Science Fiction and supernatural elements in Silent Möbius? KA: I initially started with the character concepts. I wanted each character to have completely unique abilities, whether they were a psychic, a cyborg, or a magic user. I also wanted a team with a lot of girls in it. I like drawing girls. And I wanted to make a series in which there's a character for everyone to like. That's why there's so much diversity in the team. It's nice to see the man behind the box. KA: I've decided that I'll start revealing my face this year. Are there plans to continue the Silent Möbius anime? KA: The anime series didn't reach a conclusion because I wanted to continue the story in the manga. I would have liked for the anime to reach a conclusion, but the enthusiasm that the fans and I have wasn't shared by the anime producers. They said the series was finished and didn't want to go back. What was your inspiration for the design of Steam Detectives? KA: I wanted it to be the opposite of Silent Möbius. That one is Cyber Punk, Steam Detectives is Steam Punk. What led you to do Dark Angel in the US? KA: My Japanese publisher told me I had to wrap up the series before I was ready. A friend of mine suggested that I publish it in the U.S. I appreciate how the people in the U.S. show loyalty to a series, so I wanted to do a series here. I was fortunate to work with Image that is one of the largest publishers in the US. Volumes 4 & 5 are coming along. Why so long between Dark Angel releases? KA: Yeah, you're right. Since JD, the colorist, has been getting busy, he doesn't have that much time. And sometimes he requests that I redo certain panels for him to color. And I'm a little slow myself. I have a new colorist that I'll also be working with. I hope to be back on schedule after this summer. Did Silent Möbius end up how you envisioned? KA: With any series that you look at for a long time, you always see things you want to change. Since fan demand is so high, I'm going to go ahead and do another Silent Möbius series. **wild applause**. You're that excited? I don't have a publisher yet. Maybe if I can't find a publisher in Japan, I could give you head start and publish it first in the US. Any future plans for Dark Angel? KA: Yes. I'd like to see it made into an anime TV series or movie. Please pray that it happens. What do you want to work on next? KA: I'd like to start work on the 2nd Silent Möbius series. I hope that that will be next. KA: I'm a movie junkie. Japan is finally catching onto the idea of multiplexes. When I have the time, I can easily spend a full day at the movie theater. Diet coke and popcorn, lots of butter. I'm also a big driving fan. At a recent Chicago convention, I convinced the driver of the van I was in to let me drive. What do you think of Batman Beyond? KA: It's one of my favorite series. I also like the original animated series. I'm a big fan of Bruce Tim. At last year's comicon, I stood in line at the Warners Brothers animation line to get his autograph, and after two hours, when I got to the front, Bruce recognized me and asked, "what are you doing in line?!" He drew a picture for me, though, so I was happy. Do you have any advice for aspiring manga artists? KA: You have to realize that it's not enough to just read and watch anime and manga. You have to look at other mediums, art and movies, and take what you can use from them and apply it to comics. Watching anime and manga alone is not the way to become a manga artist. You're working with a lot of US publishers. Have you thought of living in America? KA: Starting next week, I'll be living here. Sometimes next year I'll be getting a place in the East Coast, probably New York. San Francisco is nice- good weather. The weather's actually too good. I'd probably go to Fisherman's Wharf and not get any work done. The weather in New York would make me stay inside and work. What's your procedure for designing characters? KA: I read a lot of books and watch a lot of movies. At conventions, if I see someone interesting, I'll burn their image into the back of my mind. So if you're reading my manga and you think you see yourself in it, you might be right! What are your thoughts on 3-D, CGI animation? KA: I'm very impressed by the work in Films, like Final Fantasy: The Spirits Within, and by PS2 games like Final Fantasy X. I like new things, and I'd like to see my work recreated in these mediums. I'm not certain if it will happen yet, but it will most likely be for PS2. What's your favorite series and favorite character that you've created? KA: Every character and work and create, I love equally. 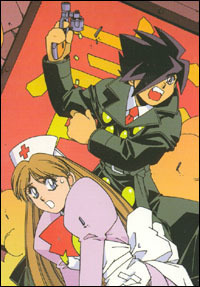 In terms of anime, I think Steam Detectives was the best adaptation of my work. 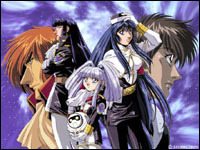 I'd worked with that studio on Nadesico, and I think they understood how to work with me. How did you get involved with Star Wars: Episode 1 manga? KA: I'm a fan of Star Wars and I wanted to work with it. When I was approached about the series I was eager to sign on. Why do you say that it is harder to draw close-up parts of characters than full bodies of characters? KA: You have to have an image in your mind of the rest of the body when drawing close-ups. You have to imagine a lot more than you actually draw. What anime series do you like to watch? KA: I don't watch much anime anymore. I watch mostly movies and news reports. I've realized that watching the news is very important. Why the name Katsumi Liquor? 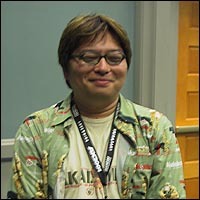 KA: I wanted to have a main character with foreign blood, as most series have entirely Japanese casts. Also, just because it's liquor! I don't drink much now, but at the time (of Silent Möbius), I went out for drinks a lot. I was very into different kinds of liquor. Would you want to be Batman? KA: I go as Batman on Halloween. I'm in the process of making a new Bat Suit for this Halloween. Actually, last year I was Darth Vader for Halloween. You've been more open in your public appearances lately. Are you more open in your public life as well? KA: I feel that I'm more open and outgoing. I thank the people of the US for that. Each time I visit the US, I feel like I open up a little more. Hopefully I can get a Green Card in New York next year and stay a while! You've mentioned movies a lot. Do you have a favorite? KA: Of recent movies, I really like Iron Giant. I saw it in San Francisco when it first came out and I was bawling in the theater. I saw it again when it came out in Japan and I was bawling again. When it came out on DVD, I was bawling a third time! When I, and other anime makers, saw this movie, we were amazed that such a wonderful movie had been made. We looked at our own work and asked ourselves, "what am I doing?" Other movies, I could go on for hours… 2001, Star Wars, Star Trek, Blade Runner… I should stop right now. What medium do you prefer to work in? KA: I've been doing a lot of work on computer. Recently I've been nostalgic for hand drawing. The upcoming Batman cover will be half hand drawn and half CG. I hear you're working on covers for Titans for DC? Do you want to do any more shoujo? KA: My version of Corrector Yui isn't finished yet. I'd like to complete that first. Do you have any ideas as to how comics in America could reach a wider audience as manga does in Japan? KA: They should be made for different age groups. Comic for kids, for young adults, and for adults. Also, being adapted to anime, games and movies helps. Would you like to see a $100 million Silent Möbius feature film? KA: Sure! If someone could find $100 million to make it! What are the plans for the new Silent Möbius series? KA: It will take place in Okinawa rather than Tokyo. It takes place in Okinawa right after the US military leaves its bases. It will deal with a greater variety of villains and criminal syndicates. The force will be more of a "Meta-crime police" than a "Mystic Police force." The new series will have 15 main chara, as opposed to 7. They will be broken into 3 teams of 5. Japanese characters will be a minority- characters will be from America, Germany, Korea, Russia, Vietnam, Japan, and other countries. Of course, they'll all be women. There will also be a great variety of ages, including a 15-year-old girl and a mother with kids. Any work with Marvel comics? KA: I've done a cover for an upcoming Star Wars Tales. It was praised by Dark Horse and George Lucas himself. I was told that it might be a poster at this year's Comic Con. I've also written a 22 page story for that series, but it's been delayed. It's about the first meeting of Darth Vader and Bobba Fett.